What a dog's breakfast. Also hard to negotiate running. Western springs road, pre motorway, made a hard right turn to end at the cnr of great south road. 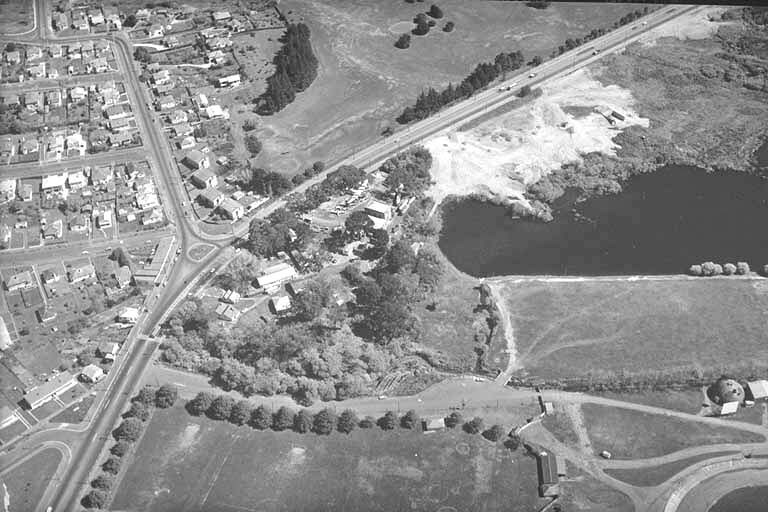 Here's a 1965 Council photo of how Western Springs Rd used to meet Great North Rd. Apparently there was a wicked fish and chippie where the petrol station now stands, well beloved by speedway visitors. You can even see the Pohutukawa 6 just to the right of where the two roads meet (actually, looks more like 5 - the younger one that currently stands closest to St Lukes Rd would have been planted a bit later). 'Directly affected' was also a phrase trotted out by the silly hat wearers opposing the Westmere/West Lynn project. Planning is meant to balance the interests of all people current and future who are passing through or staying in a place. Allowing just the owners of adjacent properties a say is ridiculous and archaic. Also, just a word of warning for those who may not be frequent all-weather riders.. Although AT has put in a strip of that yellow tread material, there’s no bike signal at the crossing. Hiya – we (Bike AKL) also noticed the matter of the "directly affected residents / owners", and called it to AT’s attention. As far as anyone can see, it was simply a copy-paste error when the web page was done, as AT engaged over several weeks before launching it publicly, and there was always clear intention for it to go out to the wider public. And it’s changed now. As for the design overall – Bike AKL clearly stated about Stage 1 (which “added” the shared paths east of the interchange) that we don’t consider them cycleways (we still grudgingly supported the signalisation of Bullock Track / GNR because of the various safety issues). We also, in the past, opposed high-level plans which called for shared paths west of Grey Lynn on GNR to Pt Chev. And I don’t think they wil ever happen as part of a dedicated larger-scale bike project for the route. However, AT’s focus was (and should still be, clock’s ticking to finally get them done) on getting separated proper cycleways on K Road and Great North Road east of Grey Lynn town centre done first. Hopefully after that, the idea of shared paths past this section of GNR past MOTAT and Western Springs being the right way will die. I'm coming around to the idea of just closing the bottom of the Bullock Track and making life safer for everyone, tbh. But I am surprised by how terribly half-arsed the shared-use paths in Stage 1 are. Also, I've just realised that I left a pic out of the post last night (I think I had it in there and accidentally deleted it). The one past the Caltex, which makes things look a bit nicer (and has a cyclist on it!). Back in now, so the text makes sense. I think that's the real issue here. It isn't even revolutionaries really, it's just people who aren't so totally embedded in the "cars first" culture of the 70s. We keep getting road works that don't just ignore cyclists and pedestrians but are actively hostile to them. That made sense when everyone was expected to use a car and only fitness nuts rode/walked or ran anywhere. There is a generation of roading engineers brought up on the idea of excluding people (for their own safety of course). That generation are now the management in AT and that thinking desperately needs to be replaced. Great North Road was always a logical flat cycle route. Back when I rode along it to Uni it was a decent route, but the progressive addition of the motorway interchanges and slip lanes (god I hate slip lanes) have made it a death trap for cyclists and pedestrians. It could be a great cycle route, it's wide enough and connects to some great public amenities it just needs some new heads in AT to see that. Cyclists need only cross three and a half lanes of uncontrolled traffic to get to the other side and carry on with their citybound journey. Surely they are taking the piss right? Maybe Kathryn King needs to take the AT management on this thrilling ride. I understand the need for provisioning for the visually impaired but if you think these tiles provide a challenge to cycles that is nothing compared to small hard wheeled modes of transport like scooters and skateboards. They are difficult to navigate when dry and down right dangerous when wet. I avoid them at all costs then. On the plus side - I commute home on fine days from Grafton to the New Lynn end of Blockhouse Bay by scooter. This summer I have the pleasure of being off foot path and roads most of the way from the beggining of Kingsland to the top of Avondale thanks to the North Western Cycleway and the wonderful new Waterview Cycleway. I'm looking forward to the extension to the back of Olympic Park and on into New Lynn when the Whau section is completed. "There is a generation of roading engineers brought up on the idea of excluding people (for their own safety of course). That generation are now the management in AT and that thinking desperately needs to be replaced." And unless we want to wait for them to slowly fade out into retirement, we need senior execs who give these people a polite but firm "Change - or leave." message. That was really what I meant with "revolutionary". We may see some of this happening with the new AT CEO, but for example I am not sure how active Phil Goff is on this aspect (even though he has written a rather strong statement of his expectations to AT at the start, he does not seem all that actively involved in transport, at least not on walking and cycling). I know that was seriously considered, and of course, not actioned :-( Not even for a single direction closure. I suspect concern at capacity implications and blow-back from drivers was too strong, and that was before the whole Occupy thing. Gawd. I just ride through the intersection on the road. At least the road is designed for vehicles. But I'm not ever cycling at busy times. A frequent choice would be to ride in to Uni on the cycleway, but home along Gt North Rd. Riding DOWN Gt North Rd (particularly Chinaman's Hill) was one of life's great simple pleasures. There are very few such long slopes that eat up several kilometers with almost no effort, and the bus/cycle lane gave separation from motorists. Going the other way was dreadfully laborious and unsafe compared to the NW cycleway, even with the grand finale of no less than 4 stiff ascents before K Rd. The cycleway generally felt slightly less safe going home, because gravity is on your side but the path is narrow and winding, which means pedestrians are a big danger. The proposed improvements on the Bike Auckland site look good. It is somewhat irksome that the cycleway, which follows the motorway, does not go under any of the bridges that the motorway does. This would reduce cyclist and pedestrian traffic on the bridges, surely improving the traffic flow, so there is a sound reason to do it, even taking only the interests of cars into account. I guess the problem is cost - the on-ramps and off-ramps would need bridges or tunnels. Or lights, which the on-ramps actually do have now. Yet other nations somehow manage. I've seen the individual plastic studs up close, but I have no idea how well they perform or how slippery they are compared with the ceramic ones. The stainless steel studs specced for the Britomart project are a disaster in so many ways, not least the cost. .. or powered wheelchairs. Prioritising the needs of a small subgroup of disabled pedestrians has also had a bad effect on the overall design of Auckland's shared spaces. Confessions of a Traffic Engineer?? Wow, VeloVision is still around. Onto their third editor/owner though, and I lost interest towards the end of Peter Eland's time when he started to focus almost exclusively on his ebike stuff and VeloVision became an occasional thing. But it's good to see the mag back, it definitely has a niche IMO.